The "Dizionario storico-ragionato degli uomini illustri del Canton Ticino", written by Gian Alfonso Oldelli, is a sort of encyclopedia of 1807 where Andrea Brilli is mentioned. It should be noted that all famous people ("uomini illustri") mentioned in this encyclopedia were indeed, according to the author, exclusively men. A quick search in the Internet concerning Andrea Brilli didn't give much information on his personality, but IH has managed to find out that he served for the Russian Zarist Empire, particularly under Peter the Great and Empress Anna Ioanovna. We decided to contact the Russlandschweizer-Archiv RSA (Russian-Swiss Archive) in Zürich in order to learn what was known about Andrea Brilli. Indeed, the archive had some information on him, albeit there were only few pages of a correspondence that dated to 1983 between Professor Carsten Goehrke and Mr. Luigi F.C. Naef of Lugano interested in Andrea Brilli. For sure, Andrea Brilli was born in Cureglia near Lugano on 12 September 1682. His father was Carlo Simone Brilli married to Anna Maria Soroli; they both were from Cureglia. Andrea's parents married in Cureglia on 24 January 1666. According to the Russian Biographic Dictionary of 1908, Andrea Brilli (in Russian: Andrej Brill or Andrej de Brill or in some sources even Andrej Brilly) had a military background gained in France, Sweden and Prussia. 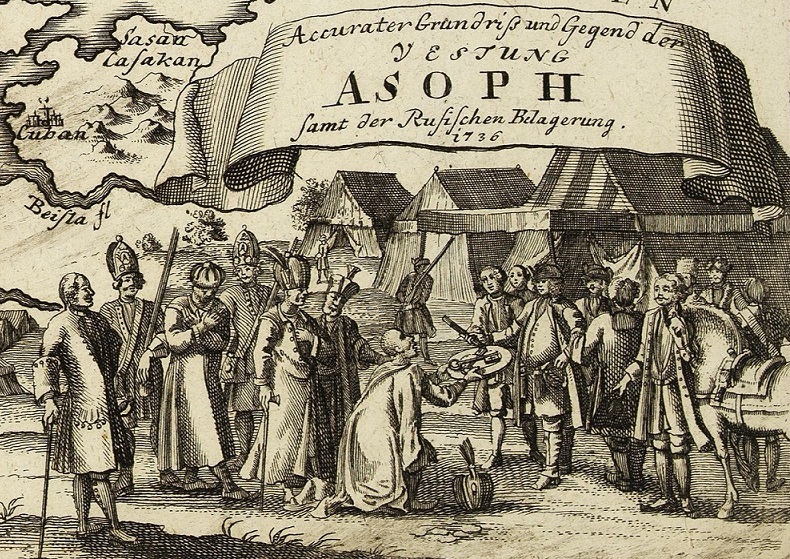 He was in Berlin in 1701 where he met the Russian Ambassador, Izmajlov. Brilli accepted his proposition to serve for the Zarist Empire and went to Moscow where he had to pass a professional exam on his military skills before entering the service. The exam was delivered by a French officer named Lambert. Brilli passed the examen successfully so that he was promoted to the rank of captain in the Engineering Corp. Brilli's previous military rank remains unknown, but most likely, he was ranking officer while serving the French, Swedish and Prussian armies. Brilli managed to accomplish a brilliant military career in the Zarist Russia. In 1723, he was promoted to the rank of colonel. At the age of 43, he became a general in 1725. In 1731, he was then assigned to Eastern Ukraine where he was tasked to reorganise the militia of Malorossia. The term Malorossia is formed originated from two Russian words: Malinki and Russia, meaning in English Little Russia. This term traced in fact its origin back to the medieval times and was widely used of that time as the name for a geographic territory that was much similar to our Insubrica region, meaning a vast territory but not referring particular to a single place. From the middle of the seventeenth century, the word Ukraine (in Russian: Ukrayina) was used sporadically, until it was reintroduced in the nineteenth century by the conscious effort of several writers who wanted to awake the Ukrainian national conscience. It was not until the twentieth century when the term "Ukraine" started to prevail substituting completely the term "Little Russia" that fell out of use. During the period of 1736-1739, Brilli participated in several military campaigns against the Turks and Tatars, notably in the Russian armies of Count Burkhard Christoph von Münnich (1683 – 1767) and Count Peter von Lacy (aka Pyotr Petrovich Lacy (1678 – 1751). In 1736, Brilli fought in the Don Army which took the key citadel of Azov and, next year, crossed the Syvash marshes into Crimea, where Russians were forced to fight against 15'000 men during two battles on 12 and 14 June. In 1738, Brilli won Crimea taking the fortress of Çufut Qale near the Khan's capital, Bakhchisaray, defeating definitely (it would be more correct to write exterminating) the Tatars hordes out of Crimea. Brilli left Crimea for Latvia, as he was apparently tasked to become a Governor of the city of Riga. The Swiss sources reported on this fact, however there has been no other trace that Brilli was ever a Governor of Riga. For sure, he was promoted in 1741 to a Lieutenant-General in Riga. On 30 August 1744, he was decorated with the Order of St. Alexander Nevskij; at that time, it was one of the greatest military medals in the Russian Zarist Empire. The medal was a direct consequence of Brilli's role with the army commanded by General von Lacy during the Russo-Swedish War of 1741-1743. Brilli took part in the military attack of the Swedish city Villmanstrand (at present, Lappeenranta in Finland). It is likely that Andrea Brilli stayed in Riga at least till 1751. On this date, the Münchner Zeitung wrote that Brilli together with Scottish General Maier Broune (most likely, General Browne) and German General Friderici were seeking to leave the Russian Zarist Empire other assignments. In 1751, Andrea Brilli had to be 69 years old. But, the sources vary. For example, according to the Russian Biographic Dictionary of 1908, Andrea Brilli died already in 1746 or 1747. But it is somehow most likely that Andrea Brilli died later in 1762. This is possible because he was cited by Münchner Zeitung in 1762, and it makes us to believe that plausibly, he lived till 1762. It is not known whether Andrea Brilli was married or had children.